The 12 Alien Driver's License pictured are each covered with a plastic Laminate exactly like a regular U.S. Driver's. Each Alien Driver License is display online with a copyright "C" stamp has been placed on these pictures to insure non duplication. Alien Driver Licenses you will be purchasing will NOT have the C copyright imbedded on the front of the license. Each Alien Drivers License size is 2.875" wide by 1.75". FREE shipping within the United States. 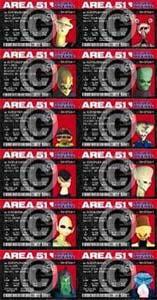 Regular price for set of 12 Area 51 Alien Drivers License is $59.40. Regular retail price is $9.95 per.